In the distance a bird sings breaking the dead silence. Despite a few insects occasionally buzzing past, there is no life at all. The remains of one of the most diverse environments in the world lie charred. Burned trees, roots and branches are scattered like headstones in a huge cemetery of war where fields of the dead stretch as far as the eye can see. The heat rising from the black soil is unbearable. Man made channels cut black scars through the wasteland. The logging companies construct these deep ditches to drain the rainforest as the two predominant cash crops, palm oil or acacia trees do not thrive in the wet conditions of equatorial rainforest. After taking out choice trees of value, a petrol canister and lighter is all that is needed to remove the remaining vegetation. This recently destroyed rainforest neighbours Teluk Meranti, a small village on the front-line of the conflict between logging companies and locals fighting to protect what they see as their forest. Nearly half of the village's 50,000 hectares of rainforest has been signed off for clearance by government officials. The ground bed of the peatland rainforest is composed of a braided root system formed over thousands of years. The layers can sometimes be up to 15 metres deep and represents one of earth's largest carbon stores, making deforestation one of the dirtiest businesses on the planet. According to Indonesian law it is forbidden to clear rainforest with peat layers deeper than 3 metres, but even if the depth is relatively easy to measure it is poorly monitored and corruption is rife. "This forest has belonged to our village for generations. Now they are taking it away from us," says Mohammed Yusuf, a 54-year old farmer living in Teluk Meranti. "People are afraid to use the forest as they always have done. They no longer dare to get medicines, timber and food because they don’t want to end up in trouble with the company, people have been badly injured and even killed in conflicts like this." Through man made channels nutrients are flushed out causing severe acidification of lakes and streams. "Fish catches have declined dramatically since the companies began to convert rainforest to plantations. They are selling away the future," adds Mr Yusuf. The situation in Teluk Meranti is just one of many of its kind. 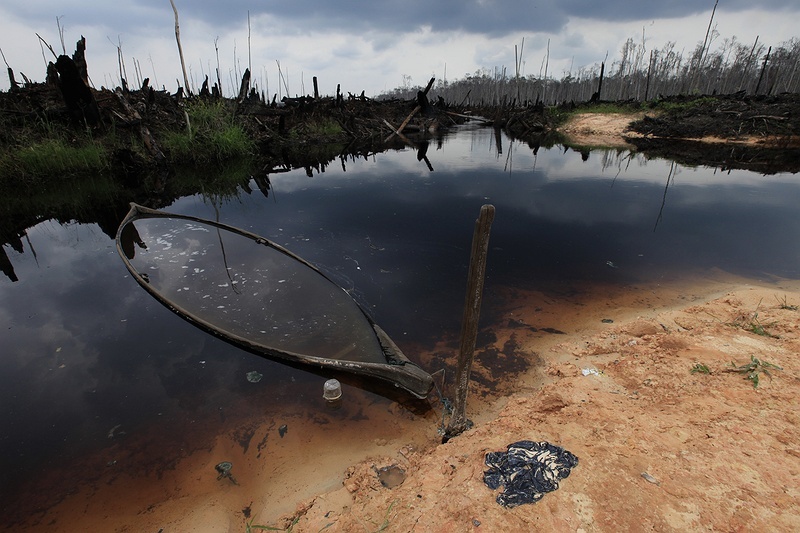 Hundreds of conflicts have flared up in the context of deforestation in Indonesia. In 2009, 700 homes were burned down in the village Suluk Bongkal in Sumatra when a firm shot down fireballs from a helicopter after protests from villagers. "70 people were detained and released after ten months without a proper trial," says Martin Baker, communications director for Greenpeace South-east Asia. In another conflict, three men from the village of Rokan Hulu died after a dispute with security guards from one of the major paper companies. "One of them died due to injuries, the other two were found drowned in a lake," says Baker.